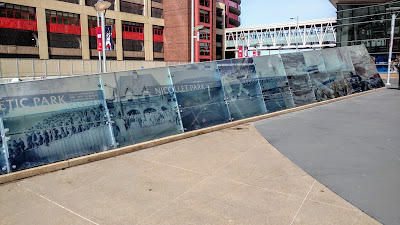 I've seen the Toronto Blue Jays in every American League road city except Oakland, so I've decided to add new ballparks to my Toronto on the Road quest. 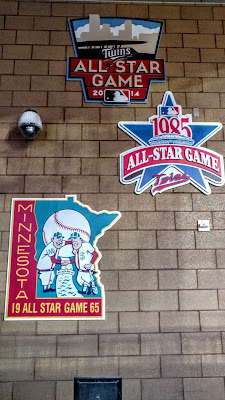 I saw the Jays play in Tiger Stadium in 1985, Comiskey and the Metrodome in 1990, and the Kingdome in 1991. 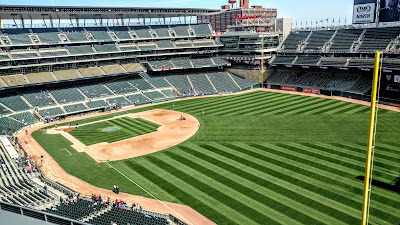 All of those parks have since been replaced, thus, I now include Comerica Park, Guaranteed Rate Field, Target Field, and Safeco Field on my list of places to see the Blue Jays. 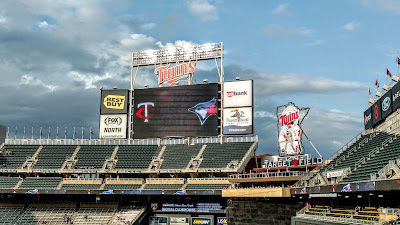 This season, Minnesota was the first of those to be visited by Toronto, so I decided to take a one-night trip to Minneapolis to see the last two in the three-game set. 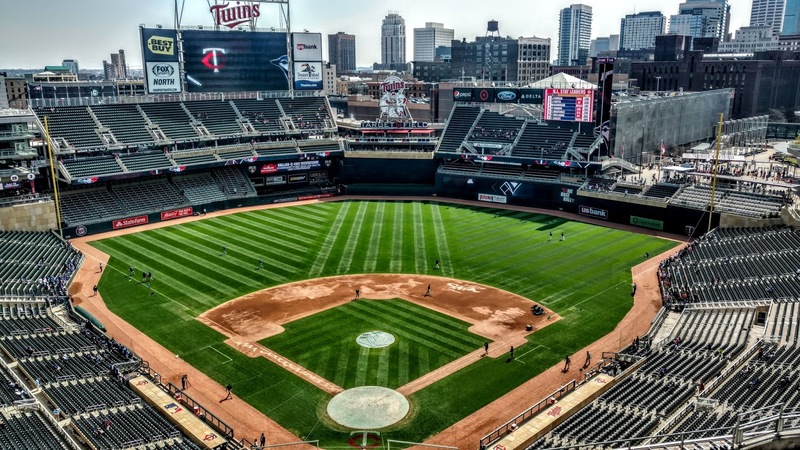 I first attended games at Target Field during its inaugural season in 2010, and covered the ballpark extensively, with three separate posts detailing all that you needed to know. Rather than rehash that information, I'll just highlight some of the changes I noticed. Target Field is located on the west edge of downtown, and is easily accessible via the Blue Line on Light Rail, which also runs through the airport. My flight landed around 4:30 and I was at my hotel, located just a minute away from the ballpark, within an hour. 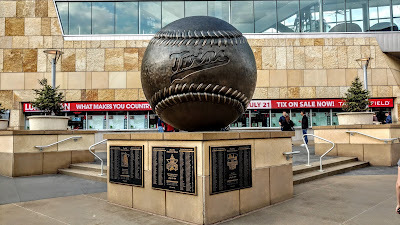 After dropping off my bag, I headed over to Gate 29, so named for Rod Carew, whose iconic batting stance is beautifully demonstrated in a statue out front. Each gate here represents a retired uniform number and the statue of the player who sported that uniform is found in front of the gate, so take a walk around before entering. 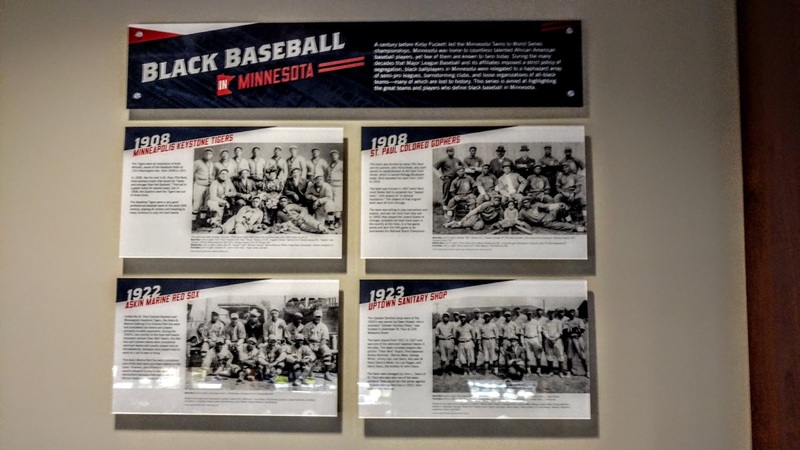 Gate 29 is also where you can find a display of every past ballpark used professionally in the Minneapolis area. 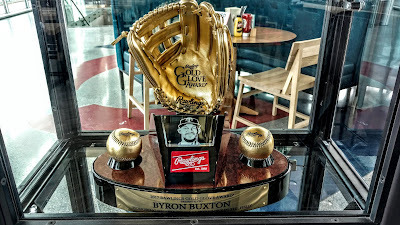 Target Field has so many of these touches that you really need to visit twice to see them all. I didn't have much time to tour the whole venue on Tuesday, so I waited until Wednesday's afternoon game to do a full walk around. The first thing I noticed was Bat & Barrel, a new restaurant that is open to all fans and replaces the Metropolitan Club that was open only to fans with club tickets. 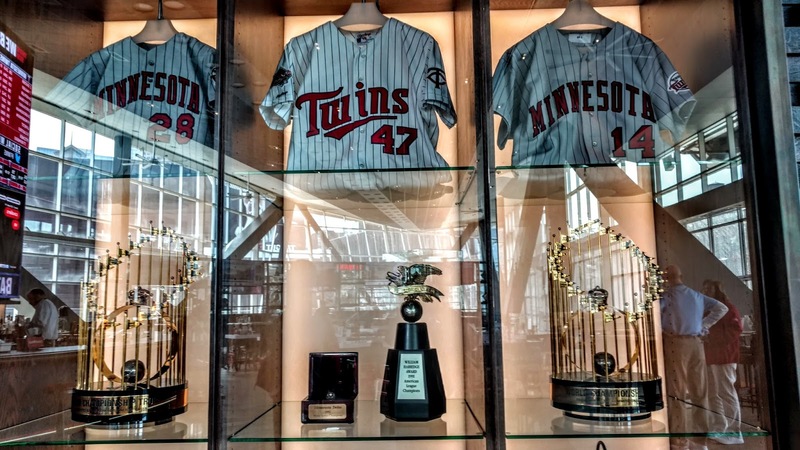 This is like a huge sports bar, with the benefit of having a large amount of Twins memorabilia. 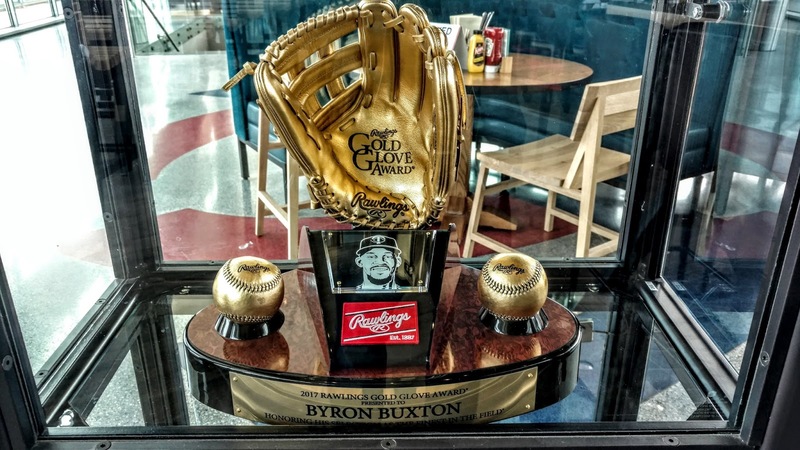 One example is Byron Buxton's Gold Glove from last year (above), but more importantly, the 1987 and 1991 World Series trophies are now available to be seen by all fans (below). 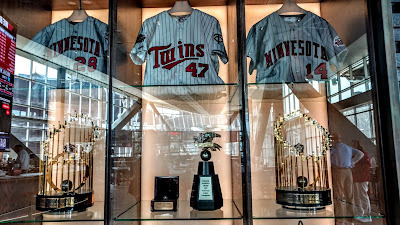 Championship trophies are the pinnacle of sports for most fans, and these two were off-limits to the average fan when the park first opened, so it is good to see that the organization has rectified that. 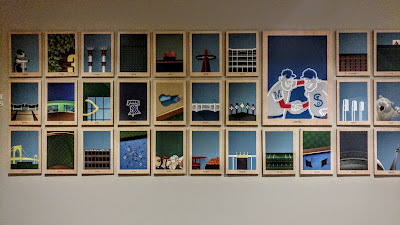 Continuing on to the hallway that leads to the Delta Sky360 Club (which is only open to fans with club tickets), you will pass by Minimalist Ballparks, a series of paintings by S. Preston, with one work for each MLB stadium. 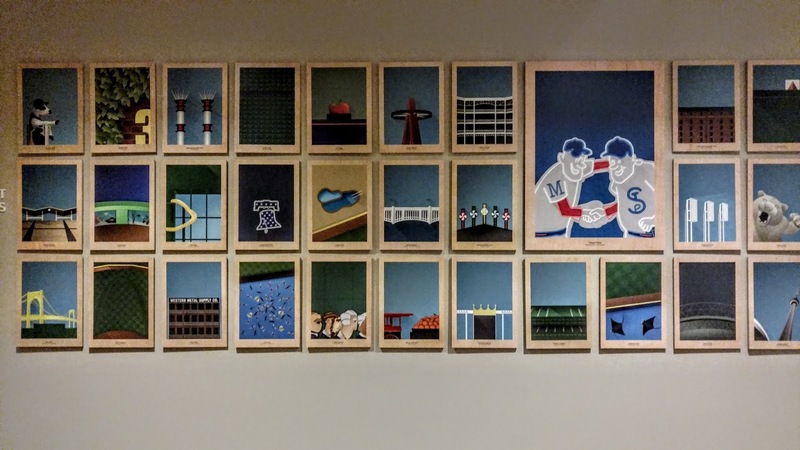 Each piece shows a small part of the ballpark, but a part that is unique so that the ballpark is easily identifiable. This is a very impressive display, especially for those of us who have visited every stadium. 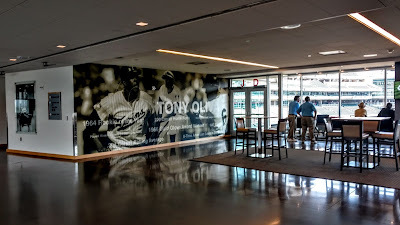 I had a Stadium Journey credential on Wednesday, and that allowed me into the Delta Club, where there is more history on display. 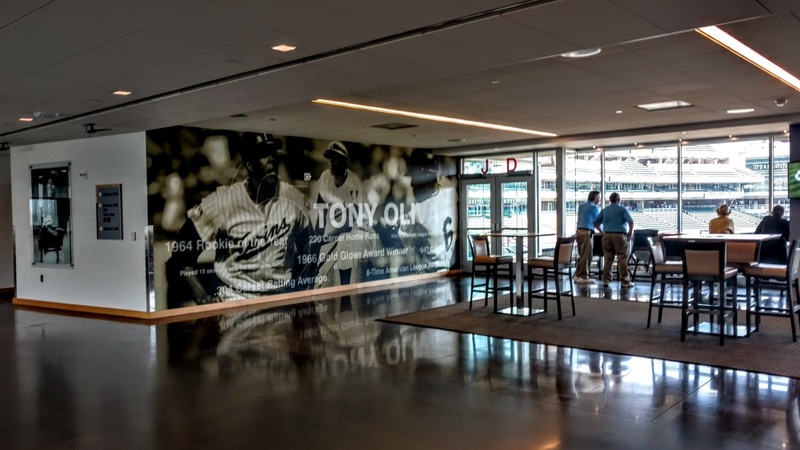 Each past star is honoured in several ways, such as a large wall photo for Tony Oliva below. If you are a Twins fan, you will want to splurge at least once to fully experience this area. The club seats are below and are cantilevered above the lower bowl, giving them excellent sight lines. Note the wooden seat backs as well. 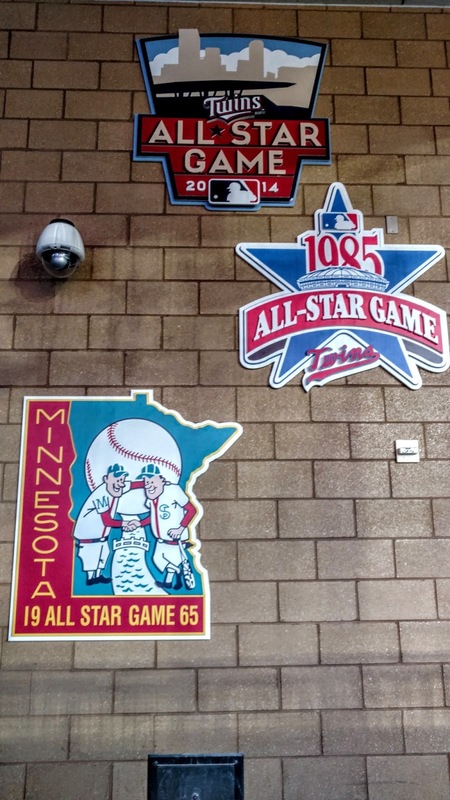 Moving around the lower concourse, stop to note the All-Star Game logos that are posted on a wall behind left field. Don't try to steal one, though, the camera is watching you! 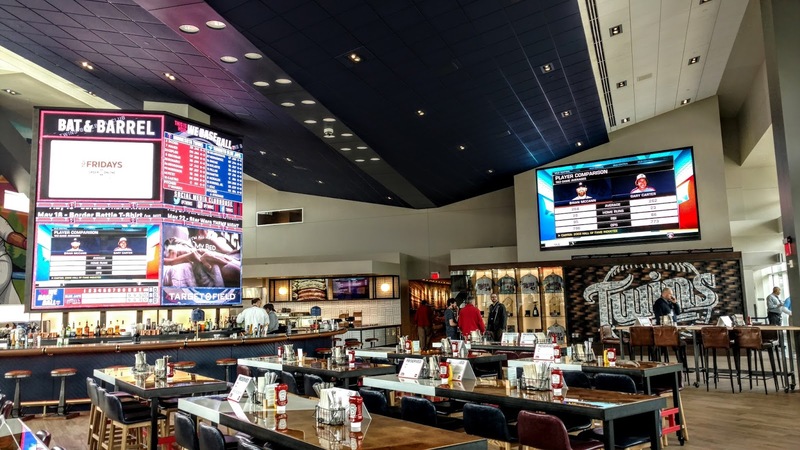 Above left field is the Town Ball Tavern, one of many sit-down eateries that can be found inside the stadium. Photos of local ballparks are featured here, as well as a display on black baseball in the state. There is so much more to see here, so make sure that you get there when gates open and use the full two hours to take a slow walk around. I haven't even mentioned the incredible variety of food that is available; pick up a concessions guide at Guest Services to see the full menu. 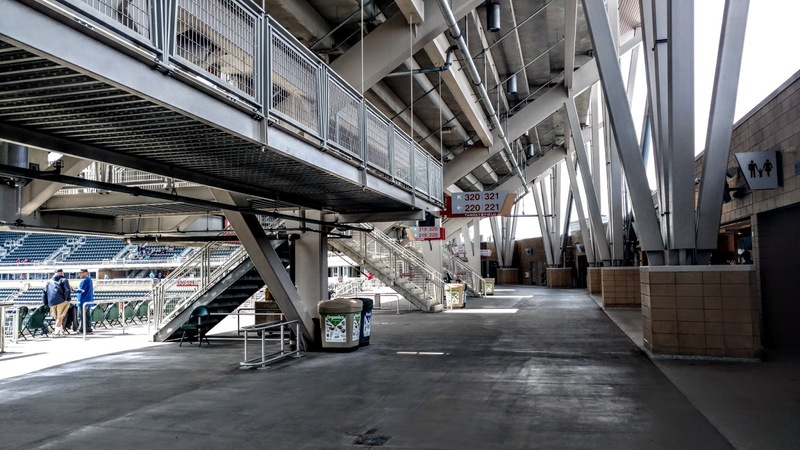 The Jays are not a popular draw, so I was able to get several shots of an empty concourse. 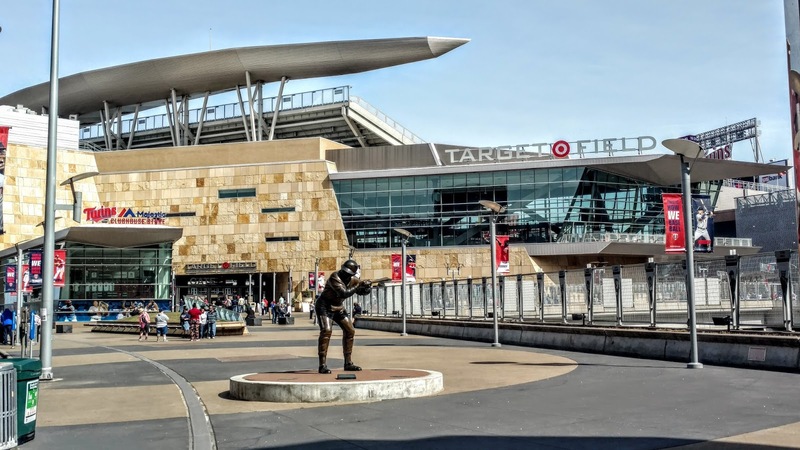 When Target Field opened, it was sold out for the season, but eight years on, the lustre has been lost and it is easy to get a cheap ticket these days. 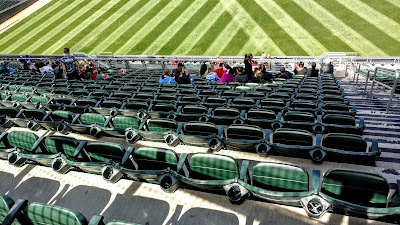 I also wandered through the seating bowl, going to the farthest point down the right field line (above). The Budweiser sign at the top is where the Budweiser Roof Deck is located; this is a new party area that is usually reserved for groups but is open to individuals on Thursday. 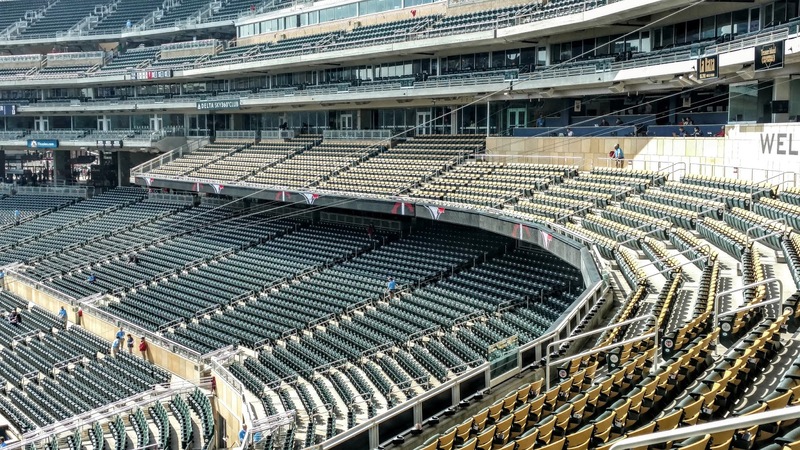 Above is the very steep grandstand above right field; below is the view from the top. This seems to be one of the more severe inclines I've seen in pro sports. Finally, the shot from behind home plate, with a partial view of the Minneapolis skyline in the distance. 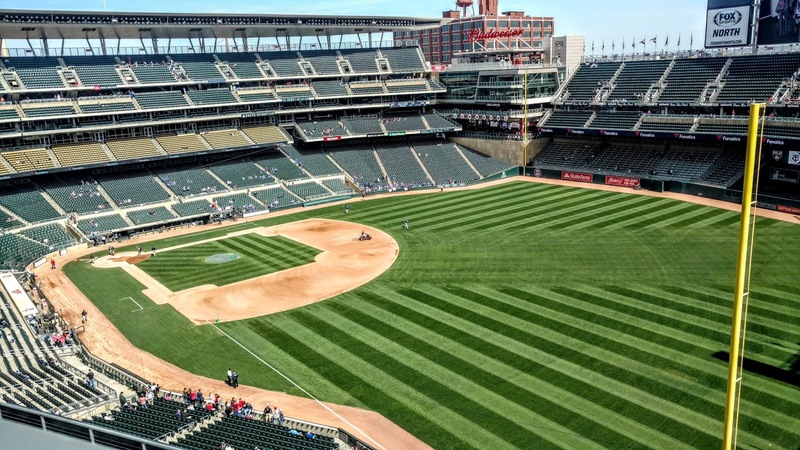 The best place to site is along the third base line as the majority of the buildings are southeast of the ballpark. 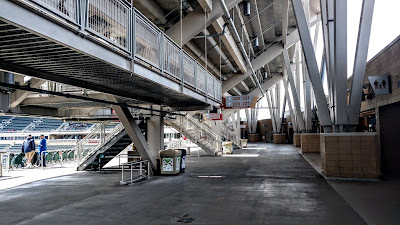 The ballpark is built on the second smallest footprint in the majors (AT&T Park in San Francisco is smaller) and you can see that in the panorama shot below. It is amazing how much they are able to fit in such a relatively small area. 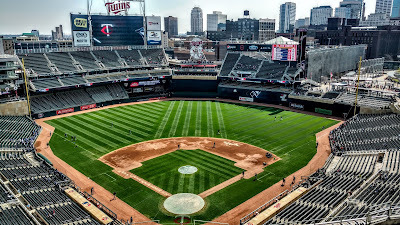 Overall, Target Field is one of my favourite ballparks and certainly one of the most underrated. It checks all the boxes for me: downtown with plenty of bars around, easy public transit, lots of history on display, and standing areas with drink rails. I am already looking forward to my next visit; I just need an excuse to get back here. Tuesday night saw Marco Estrada facing Kyle Gibson, who I had seen at Yankee Stadium in his previous start, where he took a no-hitter into the 6th. 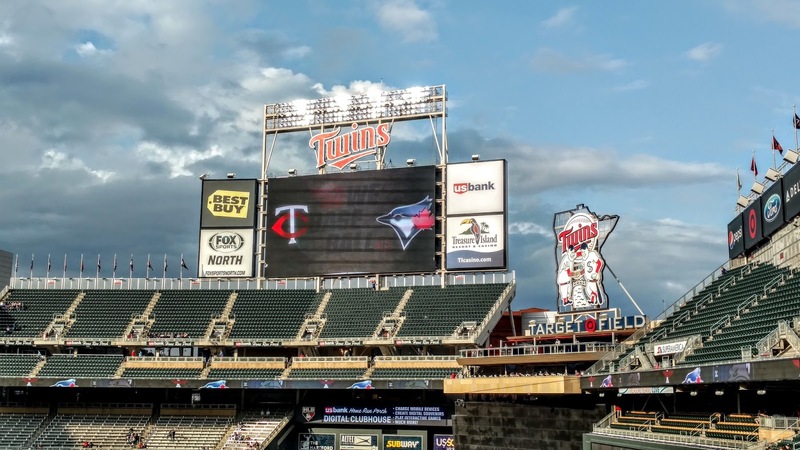 The Twins scored a couple in the first including a solo homer from Joe Mauer, and Gibson kept Toronto off the board until the fifth, when Kendrys Morales homered and Justin Smoak singled home Luke Maile. 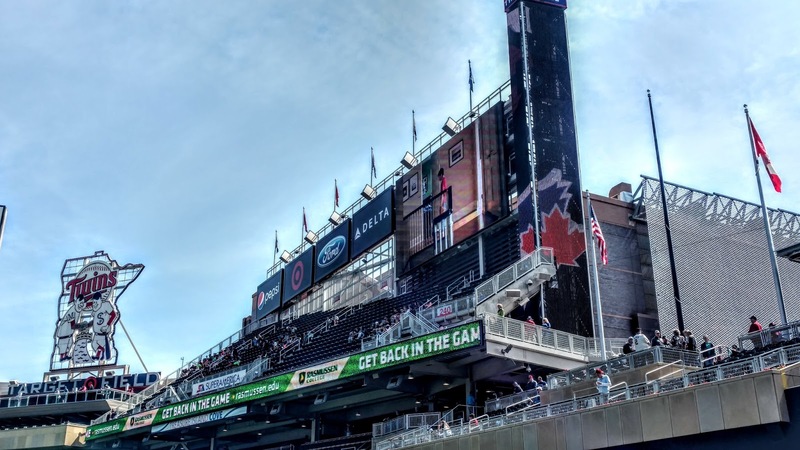 Morales added another solo shot in the 6th to give the Jays the lead, but Eddie Rosario responded with a 2-run shot in the bottom half to make it 4-3 Twins. In top of the 8th, with Addison Reed on the hill for Minnesota, Smoak walked, went to third on a Yangervis Solarte double, and scored on a sacrifice fly from Kevin Pillar. Neither team could add to their total in regulation, so we went to extras, where the Blue Jays mounted a rally off John Curtiss in the 10th. A Pillar double was followed by an intentional pass to Morales and a regular walk to Maile. A wild pitch, infield single from Aledmys Diaz, and another wild pitch resulted in 3 runs, more than enough for Roberto Osuna to get a 6-pitch save. Jays win! 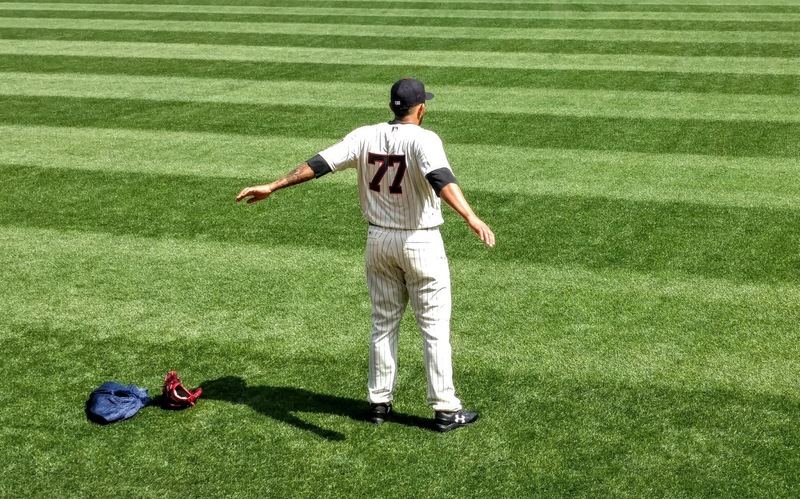 The next day saw Fernando Romero, the Twins top pitching prospect (below), making his major league debut. He was stellar, pitching 5.2 shutout innings before his bullpen picked him up, while his offense gave him a couple of runs off Marcus Stroman, including another Rosario homer. 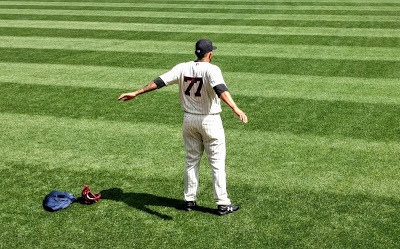 Four Twins relievers completed the shutout, while Minnesota added a couple of insurance runs in the 8th to win 4-0. I'll take a road split, but wish I could have seen Monday's game, which the Jays won 7-5, as they took the series 2-1. Curtiss was sent back to Rochester after the game to make room for Romero on the roster, leaving with a 40.50 ERA (3 ER in 0.2 IP). Hope he gets back to lower that a bit.